with Welsh Artist Christopher Langley. 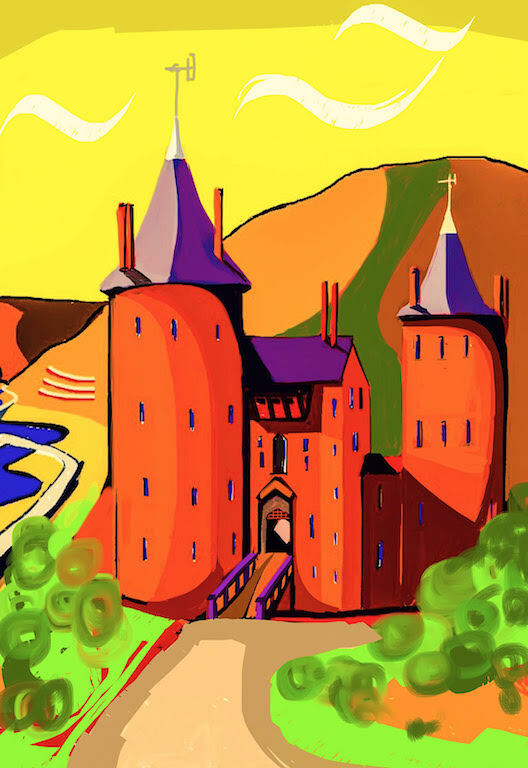 An abstract impression of the iconic Castle Coch. While resting on ancient foundations, Castell Coch (Red Castle) is relatively modern, the by-product of a vivid Victorian imagination, assisted by untold wealth. The Middle Ages fascinated the Victorians as much as the Victorians fascinate us today. High Gothic was the order of the day.The ‘eccentric genius’ William Burges was given free rein by his paymaster, John Patrick Crichton-Stuart, the 3rd marquess of Bute, to create a rural retreat to complement the opulence of his main residence, Cardiff Castle. He didn’t hold back. Dazzling ceilings, over-the-top furnishings and furniture were liberally applied.Detailed architectural drawings still survive today and following Burges’s death in 1881, colleagues faithfully continued work on the interiors for another ten years. The castle was not suitable for, nor was it intended to be, a permanent residence and the family’s visits were infrequent.